The past five years have been baffling for gold bugs. 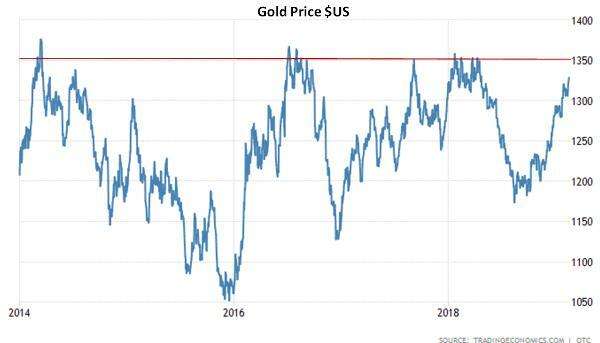 In an environment of massive central bank money creation, rising government deficits and a populist takeover of many countries’ political systems – all of which should be great for safe-haven assets – gold has spiked to around $1,350 four times, only to be smacked back down each time. Very demoralizing. And now it’s gearing up for another try. It’s obvious that the forces now at work in the world will eventually send terrified capital pouring into sound money like gold and silver — and that, from a technical standpoint, piercing $1,350 resistance should trigger a big, fast move to the next resistance level somewhere in the high $1,400s. But the “when” part of this story has become an embarrassment, given the number of disappointments the past few years have dished out. So why risk ridicule by going back there? Because, damn it, $1,350 will be not just pierced but shattered one of these days. And next week could be the week. I know, Charlie Brown’s football, Einstein’s definition of insanity, Sisyphus’s boulder, some people never learn. But the world really is set up for serious instability, and two new factors have swung in gold’s favor since the last failed attempt. First, central banks have become fairly aggressive net buyers of gold. Recall that not so long ago central banks as a group were dumping gold on the market in order to “diversify” their reserves into government bonds. Now they’ve apparently seen the error of that approach and are back to buying. See Central bank gold buying hits highest level in half a century. This is a big, not-especially-price-sensitive new source of demand that might not view $1,350 as a reason to slow down. Second, the Fed, which had been promising to tighten for years and then actually did tighten for one year was, like the proverbial mule, smacked in the head with a stock market two-by-four. That got its attention, and the tightening has stopped, to be replaced shortly with another, probably much bigger round of easing.